The thought of building stairs to gain access to your attic sounds daunting and expensive! But attic ladders has become part of a straightforward and very simple process that has since been adopted by tens of thousands of homes across Australia. It has enabled not only additional home storage but in many cases has also created an additional living space. On average, houses with roof cavities can gain an additional 50% floor storage space by gaining access to the roof space (attic). Imagine how clutter-free your house will be with all that extra space! Finally you might achieve that minimalist look you have been after without having to throw out half your possessions. Access your roof space with ease – there is no need to drag the ladder out of the shed or have trades people knocking into walls when they drag their ladders through your home. 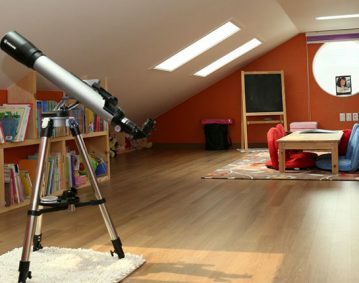 Create an Attic Room in your unused roof space. Mostly overlooked, an Attic ladder gives you easy access to that untapped storage or extra living space you might have be missing out on all these years. An Attic Ladder is an ideal and practical device to give you ease of access without sacrificing floor space and safety. They are designed to fold or pull out with little effort – simply reach up with a supplied hook pole and pull the hatch open. Many have innovative spring mechanisms so the pull down and fold up process is smooth and almost weightless. There are two basic types of attic ladders – pull-down and folding. 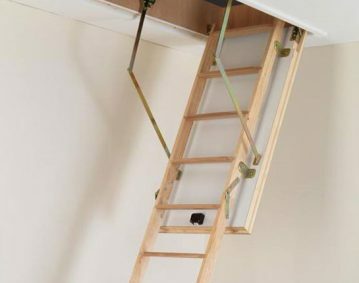 Pull-down attic ladders descend from the attic hatchway in one singular piece which is attached to the rectangular hatch door. This type of attic ladder system is traditionally sturdier and more stable than the folding ladder system. 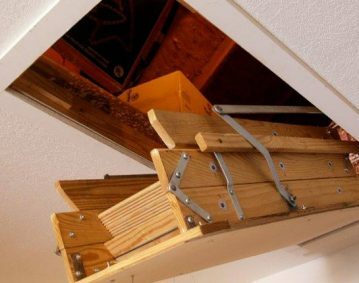 Folding attic ladders are simply that; attic ladders that fold up to fit inside the ceiling hatch. This type of ladder installation is better suited for smaller attics or attics in which there is not a lot of room for gaining entrance. Folding ladders can be purchased in either wood or aluminum. Wooden ladders are easier to fold, but aluminum ladders are lighter and resistant to rot and splinters. This is basically a preference of choice issue. Whenever purchasing an attic ladder, it’s a good idea to choose one with at least a 125 to 175 kilo weight limit. Because many local authorities have stringent laws and fire codes in place regarding firewalls, you must find out if your municipal council allows the installation of an attic ladder system. Before you purchase an attic ladder, be sure you check the dimensions very carefully. Some attic ladders may list the dimensions from the floor to ceiling while others may list them as the floor to the attic floor. Before you begin your attic ladder installation; be sure to read over the instructions at least two times. Installing an attic ladder system isn’t the easiest job in the world and if you’ve never done it before, it can prove challenging.